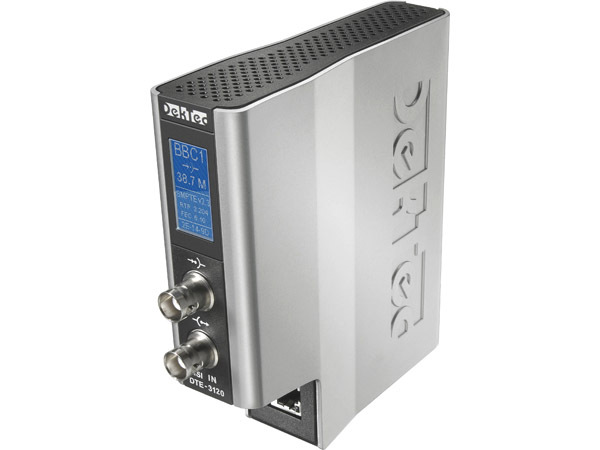 DekTec's standalone power-over-ethernet enabled ASI to IP Converter, allowing zero-jitter transmission of Transport Streams to IP networks. Standalone ASI to IP converter. Standalone ASI to IP converter with StreamXpert 2.1 stream analyzer software. 19-inch rack for installing DTE-31XX units. Table stand for one DTE-31XX unit. As a companion device for the DTE-3120, the DTE-3100 offers IP to ASI conversion in the same fashion as the DTE-3120. Standalone module for integration in other equipment. The DTM-3200 converts either IP to ASI or ASI to IP (user programmable). If you require a web GUI or SNMP for control, then the DTE-3120 is the best choice if you. Standalone module for integration in other equipment. The DTM-3200 converts four ASI streams to IP. The module supports IPv6 and IGMP v3, the latter to enable source-specific multicast (SSM).